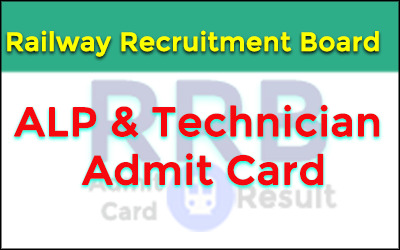 RRB Admit Card 2018: Railway Recruitment Board (RRB) will hold CBT (Online Test) for Assistant Loco Pilot and Technician. Students who have to apply for RRB ALP Recruitment 2018 or Technician Posts will eligible to download Loco Pilot admit card 2018 or RRB Assistant Admit Card 2018 from the regional website of Railway Recruitment Board. The Information regarding RRB Admit Card 2018 for the Centralised Employment Notice No. (CEN 01/2018) will be updated here. In this website, we will try to provide all the latest news on RRB ALP Admit Card 2018, and further selection process of Indian Railway ALP & Assistant vacancy 2018. Update[05.08.2018] The RRB ALP & Technicians e-call letter for 1st Stage CBT is being downloaded. Check your RRB Group C exam date and download it as per the schedule @ https://dc4-g22.digialm.com/EForms/configuredHtml/1907/57281/login.html. Update [28.07.2018]: RRB Ranchi ALP & Technician Exam Date has been announced now. The First State ALP & Technicians CBT 2018 is going to be conducted for all regions on 09.08.2018. The RRB Ranchi e-call letter will be available to download 4 days prior to the exam date. It means, RRB ALP Admit Card 2018 will available in the first week of August 2018. On 03.02.2018, the Railway Recruitment Boards has issued the detailed advertisement for selection of 26502 Assistant Loco Pilot and Technicians Grade-III. The RRB has notified all the necessary information and other terms and conditions through Centralised Employment Notice (CEN) No.01/2018 for all RRB's regions. According to the RRB Recruitment 2018 Notification, there are 26502 posts will be recruitment till 2019. This is the very quick and short period of time to complete the recruitment process against this vacancies. Where the first stage of RRB ALP Examination 2018 has been scheduled in June and July 2018. If the examination will be conducted during said month, then the RRB ALP Result 2018 June declare after one or two months. Although, the Railway Recruitment Board also conduct the second stages of the recruitment process. The candidates can get notified about RRB ALP 2018 2nd stage of examination through RRB's website. Before, commencement of examination you must be download RRB Admit Card 2018 which you have applied for. RRB can issue e-admit card for all eligible candidates who have submitted their form successfully. The candidate applied for any of the regions of Railway Recruitment Board must download the RRB ALP Admit Card 2018. If the candidates have registered online against the CEN 01/2018 for the recruitment of Assistant Loco Pilot (ALP), have to appear for Computer Based Test (CBT). RRB Loco Pilot online Test 2018 has tentatively Schedule during June and July2018. Due to a large number of candidates applied for RRB Assistant Loco Pilot Recruitment 2018 the date of examination will be decided on a different date. Applicants need to visit www.indianrailways.gov.in to know the examination date of RRB ALP CBT Exam 2018. As we have known already about the month of examination schedule of RRB ALP Exam 2018, we can assume that the admit card/call letter will be issued 10 to 15 days prior to exam date. Date for downloading RRB ALP Admit Card 2018: 4 days prior to exam date. The Board will also hold an online test for Technicians with ALP Recruitment Examination. Candidates who have registered for Technicians Grade-III posts will need to appear in Computer Based Test (CBT) Online Examination. The RRB ALP & Technician Exam Pattern and Syllabus 2018 has been given in detailed advertisement CEN 01/2018. One can read carefully all the examination scheme for selection of Technician in various discipline in Indian Railway. The RRB Technician Admit Card 2018 will be issued by the Railway Recruitment Board for each region. Applicants need to visit concerned RRB's website or Indian Railway's website (indianrailways.gov.in) to check the latest update regarding the availability of RRB Admit Card 2018. RRB Technician Admit Card download date: 4 days prior to the exam. According to Centralised Employment Notification CEN No. 01/2018, only single online application (common to the posts - ALP & Technicians) has been submitted by the candidates through the link provided by Railway Recruitment Board for each region. The entire recruitment process will involve, First stage CTB, Second Stage CBT, Computer Based Aptitude Test and Document Verification as Applicable. The date, time and Venue for RRB ALP Exam 2018 such as 1st Stage CBT, 2nd Stage CBT, Computer Based Aptitude Test and Document Verification or any other additional activities as applicable will be fixed by the RRBs. All these information shall be intimated to the eligible candidates in due courses. In this stage of Computer Based Test for ALP and Technician, there are 75 questions will be asked. The duration of test will be 60 minutes. The Questions will be of objective type with multiple choices and are likely to include questions pertaining to Mathematics, General Intelligence, and Reasoning. The First Stage CBT is of screening nature and the standard of questions for the CBT will be generally in conformity with the educational standards and/or minimum technical qualifications prescribed for the posts. The score of first stage exam shall be used only for shortlisting of candidates for second stage exam as per their merit. 9th, 10th, 13th, 14th, 17th, 20th, 21st, 29th, 30th and 31st August 2018. The Second Stage of Online Test for both posts will be conducted with duration 2 hrs. and 30 min.). This stage of the examination will be conducted in two part (Part A and Part B). Shortlisting of Candidates for the Second Stage CBT exam shall be based on the normalized marks obtained by them in the First Stage CBT Exam. The total number of candidates to be shortlisted for the second stage shall be 15 times the community wise total vacancy of ALP and Technician Posts notified against the RRB as per their merit in First Stage CBT. Part A: Duration - 90 Min. (No. of Questions: 100). Part B: Duration - 60 Min. (No. of Questions: 75). Qualifying marks in Part B will be 35% for all candidates and no relaxation is permissible. Note: Candidates are advised to visit the official website of Railway Recruitment Board to know the detailed recruitment process. You can download RRB CEN No. 01/2018 Admit Card in which all the information related to RRB Recruitment 2018 Examination for Loco pilot and Technician will be given. Dear Friend, you can bookmark this website to get latest and exact information regarding the RRB Admit Card 2018, Latest News for further recruitment process related to RRB Recruitment 2018 for ALP and Technician. We'll try to provide all information which you will be needed.